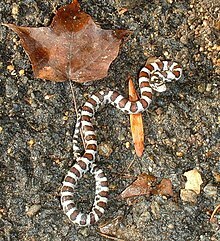 Lampropeltis triangulum, commonly known as a milk snake or milksnake, is a species of kingsnake. 24 subspecies are currently recognized. Lampropeltis elapsoides, the scarlet kingsnake, was formerly classified as the subspecies L. t. elapsoides, but is now recognized as a distinct species. The subspecies have strikingly different appearances, and many of them have their own common names. Some authorities suggest that this species could be split into several separate species. They are not venomous or otherwise dangerous to humans. They are distributed from southeastern Canada through most of the continental United States to Central America, down to western Ecuador and northern Venezuela in northern South America. 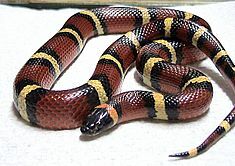 Due to the many colors of the eastern milk snake (L. t. triangulum), it can resemble the coral snake, corn snake, fox snake, scarlet snake, and most importantly, the venomous snake genera Agkistrodon and Sistrurus. Milk, fox, and scarlet snakes are killed because of a resemblance to the venomous pygmy rattlers. Juvenile milk snakes, which are more reddish than adults, are often killed because they are mistaken for copperheads. There is enough distinction among the five to make the eastern milk snake fairly easy to identify. The eastern milk snakes also has a light-colored v-shaped or y-shaped patch on the neck. One subspecies is melanistic (almost all black). 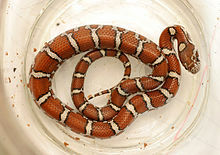 Milk snake activity is mostly nocturnal. They are primarily terrestrial and attempt to blend in with ground litter. Milk snakes are much more opportunistic eaters than the fox snake or corn snake. They have been known to consume a variety of animals including rodents, eggs, birds, reptiles, amphibians, and invertebrates. Nevertheless, the diet of an adult milk snake still primarily consists of rodents. They are nocturnal eaters and are often found during the day in old barns and under wood. Milk snakes are oviparous, laying an average of about 10 eggs per clutch, although that number may vary by region. The milk snake mates from early May to late June. In June and July, the female lays three to twenty-four eggs beneath logs, boards, rocks, and rotting vegetation. The eggs incubate for approximately two months, and hatch around August or September. Milk snakes typically live around 12 years, or up to 21 years in captivity. The milk snake is listed as Least Concern by the IUCN (a wildlife conservation union), but in some areas, they may face significant pressure due to pet trade collection. Because of this species' attractiveness in the pet trade, many subspecies are now being bred in captivity for sale. Listed alphabetically by subspecific name. ^ Web, Animal Diversity. "BioKIDS – Kids' Inquiry of Diverse Species, Lampropeltis triangulum, Scarlet kingsnake". www.biokids.umich.edu. ^ "Snakes of New York". SUNY College of Environmental Science and Forestry. ^ "The Most Common Myths About Coral Snakes | The Venom Interviews". thevenominterviews.com. Retrieved 2018-10-07. ^ "Frequently Asked Questions". South Carolina Department of Natural Resources. (see FAQ's. -- "are there any visual clues"..........). Archived from the original on 2017-12-30.